During the month of April 2014, security situation in the country has increasingly become volatile in which upsurge in violent incidents in Baluchistan played a major part followed by expiry of ceasefire by the TTP on 10th of April, which was not subsequently extended. According to CMC statistics, a total of 209 violent incidents related to anti-state militancy and counter-insurgency operations from security forces were reported in which 271 people got killed and 412 others injured. While security forces arrested 218 suspected militants, 54 people were kidnapped by the militants. There were 72 security forces operations in which 85 people were killed including 79 militants and six civilians while 36 people were injured including 12 Security forces personnel, 20 militants and four civilians. 218 suspected militants were arrested by the security forces. Out of 209 total incidents, there were 137 militant activities across the country in which 186 people got killed and 376 others injured while 54 persons were kidnapped by the militants. As compared to previous month, there was almost 19% increase in militant activities, almost 41% increase in casualties while almost 53% increase in injuries. Highest numbers of incidents were reported from Baluchistan where militants carried out 38 attacks in which 50 people were killed including two SFPs, seven militants and 41 civilians while 78 people were injured including five SFPs, one militant and 72 civilians. Sindh and KP witnessed same number of incidents (35 each). In KP’s 35 militant attacks, 33 people were killed including 10 SFPs, eight militants and 15 civilians while 88 people were injured including 25 SFPs, one militant and 62 civilian. In FATA, 25 militant attacks were reported in which 58 people were killed including three SFPs, 4 Razakars, 48 militants and 3 civilians while 33 people were injured including 6 SFPs, 5 Razakars, 11 militants and 11 civilians. 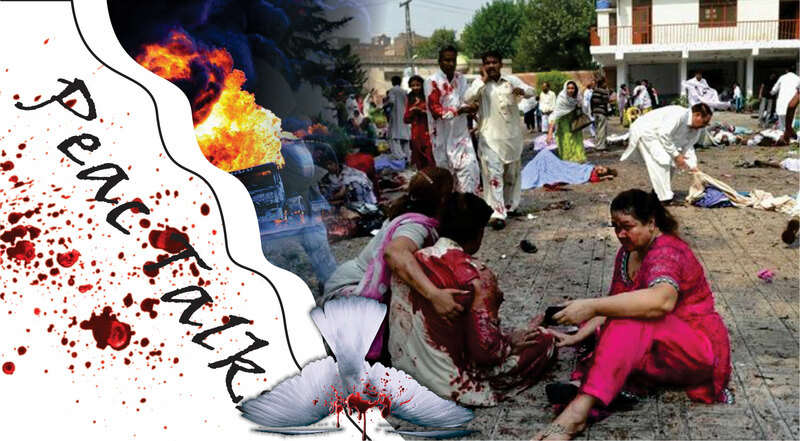 The only incident in Islamabad was the deadliest of all the incidents of the country, in which 24 people were killed and 115 others were injured (all civilians) in an IED blast in fruit market. In three incidents in Punjab, no causality was reported. 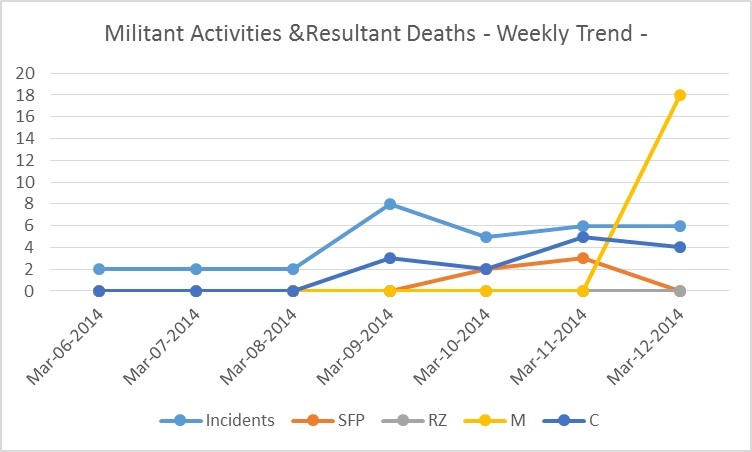 On the other hand, security forces actions have come down from 89 to 72 in April 2014. Numbers of casualties in security forces actions have gone disproportionately up as compared to the previous month as 85 people were killed (including 79 militants and six civilians) as compared to 17 in the previous month while 36 people were injured as compared to 10 in the previous month. Thus, a decrease of almost 19% was witnessed in number of operations, however, number of casualties and injuries have gone disproportionately up with a percentage of almost 400% and 260%, respectively. Security forces arrested 218 suspected militants as compared to 1078 in the previous month. Two suicide attacks, 53 bomb blasts, 28 physical militant assaults were also reported during the month. Armed clashes between rival groups of TTP in Waziristan took at least 49 lives in 8 reported incidents. 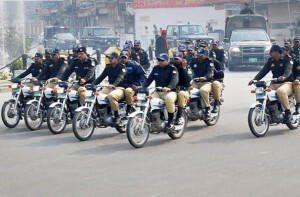 Highest number of security forces actions were reported from KP with a tally of 19, in which five militants were killed and 31 others were arrested, however, security forces actions in FATA were more lethal as 40 suspected militants were killed and 26 others injured while three others were arrested in 15 security forces operations in this region. 14 security forces actions were reported from Sindh in which 4 suspected militants were killed while 61 others were arrested. In Baluchistan, security forces carried out 12 operations in which 36 people were killed including 31 militants and five civilians while 10 security forces personnel were injured in these operations. Nine security forces operations were reported from Punjab in which 42 suspected militants were arrested while two operations were noticed in ICT in which 37 suspected militants were held up by the security forces.